For God darkness is as light. Through his own dying Christ has overpowered our enemy, death, and turned darkness into light. This is why he can now take each and every one of your darkest sorrows and worries, and turn them into blinding lights. Based on a sermon in ‘Morgencaféen GRACE’ (a café for homeless immigrants in Copenhagen), May 21 2013. Harrowing of Hell. Chora Church in Istanbul. Prayer: Heavenly Father, we pray that you will anoint us with your Spirit, that we will gain just a small spark of understanding of how deep and unfailing your love is. Yesterday we came back from Athens. It’s a city, like the rest of Greece, with a lot of history. You’d might get the idea that time was standing still, though of course it’s not. The Acropolis, that two-thousand-something years old monument, is still there. But it’s getting a bit worn down. It’s not permanent, but still you get the feeling that something in this world might be. Civilization and stuff like that. Greece is, of course, beautiful. That’s why people go there. But you don’t need to look down from the Acropolis for long to see another side of Athens. We met a guy in Athens, lets call him Nickos. He lives on the street. Drugs. Nickos got kicked out from his home, where he lived with his father and stepmother, when they couldn’t pay the bills. It’s been three years, or so. Nothing unique, rather typical. People are losing their jobs, suicide rates climbing. You don’t see it immediately, you still see those new cars that people bought just few years ago, but it’s just beneath the surface that things are falling apart. And then there’s the immigrants. Illegal and legal alike, some hundred thousands live on the street of Athens or crowded up in small rooms. It’s mostly Afghans, who get their food and basic needs covered from local Churches and American missionaries, of which we visited some. The poverty in Athens is of course nothing special compared to what you see in the rest of the world. Some of you have probably seen things even worse. But seeing something like this in a European country reminds us that progress and economical security is not permanent. Did we think that? It seems that we Europeans believed poverty to be a thing of the past. But the big crisis (as if there weren’t always some crisis! ), reminds us that nothing in this world is permanent, not even civilization itself. At least it should remind us that. It should, because it’s exactly when we come to know that, that we realize that the only permanent thing is not of this world. The only permanent thing is God himself. What do I mean by that? God is love. This is permanent. It means that there is nothing that can change the fact that God loves you. John writes so repeatedly in his first letter, and we also hear it other places in the bible. It is simply impossible for God not to love. Some might say, ‘oh no, he is also righteous, he does not always love’. But the bible never defines him so. God is love, justice is something he does. God’s righteousness is always an expression of his infinite love. That means, that no matter who you are, no matter where you are, no matter where you’ve been, no matter where you’re going, God’s love is deep enough to follow you. God’s love never lets you go. There is nothing, Paul says, that can keep us from the love of God, neither life or death, things present or things to come, nor angels, demons, powers or principalities. Nothing! This is no mother’s soft, fluffy-kind-of-love, of course. God will not spare you from suffering. If my mother had the chance, she would protect me from any hardship I might encounter. God is no mother-in-the-sky. But his love follows you wherever you go, even in your deepest darkness. And eventually it will also get you out of there again. But then again, you may be thinking, is Jesus not speaking harder words? Does God really love us no matter what path we are on? Doesn’t Jesus say something about the wide and the narrow gates? Indeed, for “wide is the gate and broad is the road that leads to destruction”. And doesn’t he say something about that needle, the camel and the rich man? Yes! It is easier for a camel to go through the eye of a needle than for a rich man to enter the kingdom of God (Matt. 19:24). But who is this rich man? Now, you can easily imagine some guy heavily loaded with stuff, burdened by all his goods, in an awkward posture, that nevertheless does not help him go through the narrow gate. Bumping against its walls and ceiling. But of course Jesus is not only talking about material wealth. Blessed are the poor in spirit, he says at another occasion. It might be comfortable to think of the rich man, who cannot enter the Kingdom of Heaven, as the wealthy Scandinavians or Americans, or maybe those one percent of the world’s population who owns ninety percent of its goods, or whatever the numbers are. But I’m afraid that’s not how Jesus saw it. He was more strict than that. In Jesus’ definition, anyone who has more than he needs, anyone who has the smallest coin and does not give it to those who needs it, is too rich to get through that needle’s eye. And not only that. Anyone who relies more on what he has than on what he is given by God, is too rich to enter the narrow gate. Jesus’ disciples were amazed. But who can then be saved, they asked him? Jesus’ reply should be noticed by all of us: With people this is impossible, but with God everything is possible! With God, everything is possible. Is it possible for any one of us to get on that narrow path by our own help? Can we actually make ourselves so poor that we will inherit the kingdom of God? I do not know what road you are on right now. But I do know that wherever you are, and wherever you’re going, God is fully able to grab you and put you on the path that leads into his kingdom. I have no clue how He will pull you through that needle’s eye, and I do not know how it will look like. But for God everything is possible. This is why David says in one of his psalms, that even if if I make my bed in the depths, you are there, meaning even if he dies, and goes to the kingdom of death, God’s love will be there. God can do this because he has been through the deepest darkness himself. 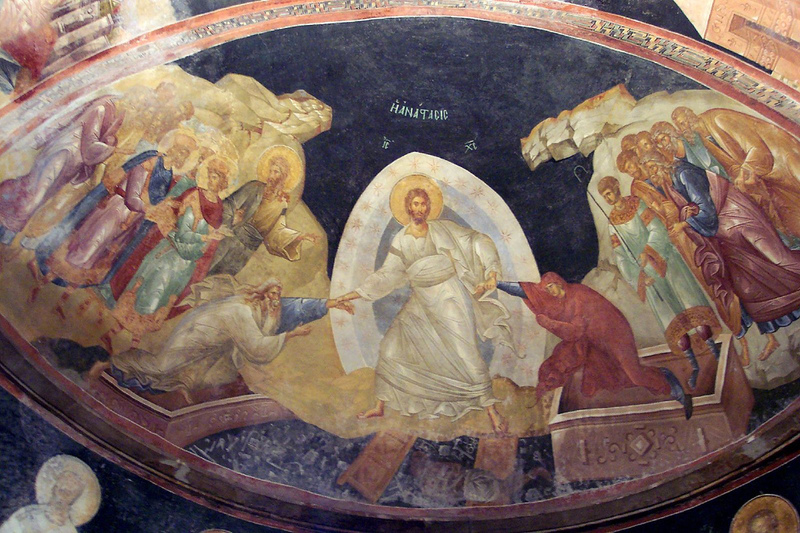 In that endless pit of death, his Son entered to conquer and overthrow the reign of death. This is why God’s love is never failing, even if it is no mother’s love protecting you from your toils and hardships. As with Christ, it is by death we enter life. Again, we do not have a clue how we will get on that straight and narrow path. But we do know that for God everything is possible. And we know that God is love. Heavenly Father, we pray that no matter on what path we tread, your love will guide us to the destination which you see fitted for us.